Keith Roney participated in many familiar Saskatchewan sports, such as hockey, curling, and baseball as a young man growing up in Bulyea. 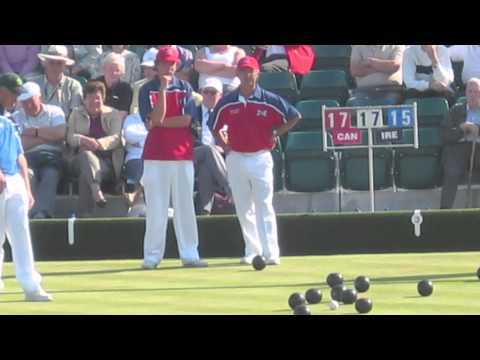 It wasn’t until Roney was in his thirties, however, that he would discover the sport of Lawn Bowling. Roney first began playing at the Regina Lawn Bowling Club in 1979. He won his first club medal that same year as part of a men’s fours team. His early successes at the club level naturally led him to take part in provincial events. He won his first Provincial Championship in 1980, also in men’s fours. Beginning in 1982, he began a streak in which he won at least one Provincial Championship in each year for twenty-nine straight years. In the stretch from 2003-2011, he held at least two Provincial Championships seven times. Roney’s impressive skills brought him success at National-level events as well. He won his first national medal—a bronze in men’s singles—in 1982. In thirty-one years representing Saskatchewan at the Canadian Championships, Roney has won twenty-seven medals: seven bronze, twelve silver, and eight gold. In 1985, and then again from 1988 through to 2011, Roney represented Canada at thirty-two International events as part of the National Team. Over that time, he won ten medals. Perhaps the pinnacle of his time with the National Team came in 2004, when he and Ryan Bester won the gold medal in men’s pairs at the World Bowls. It remains, as of 2012, the first and only gold medal won by Canada at the World Bowls. Roney’s commitment to Lawn Bowls extends beyond competing. He has served on the Saskatchewan Lawn Bowls executive council for over twenty-five years and on the organizing committees for the National Championships each time the event has been held in Regina. He is a certified national umpire, working at both provincial and national events. And, most recently, he has been the team manager & coach for the Saskatchewan teams at the Canadian Championships in 2011 and 2012. Installed in the Saskatchewan Sports Hall of Fame on June 15th,2013.